Whaler 259 is a one bedroom/one bath partial ocean view condominium located on the 2nd floor on the south side of Tower II. 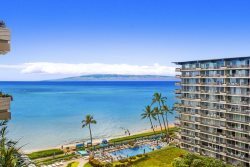 This unit does offer a view of the ocean while sitting outside on the lanai. From inside, you have a great deal of privacy with the unit facing out to the lush foliage separating the property from Whalers Village. This condominium has a few furnishing updates not reflected in the photos. Master bedroom has a King size bed, living room has a Queen size sofa sleeper to accommodate up to 4 guests comfortably. 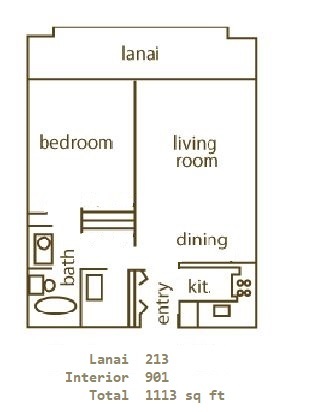 All units feature full kitchens, full baths, central air conditioning, and a large private lanai (balcony). This place was great! Centrally located, right on the beach with nice kitchen, larger than expected unit and within walking distance to many other hotels, black rock (which is great for snorkeling) and Whaler Village. Everything about the listing was accurate. I couldn't have been happier with the condo. Checking in and out was very easy. We just returned home from this vacation rental. Great property. Friendly/easy mgmt. Traveled with our two teens. The unit is spacious. We rented an extra cot so our kids didn't have to share the pullout. Plenty of room to accommodate the cot. The unit is cozy. The kitchen has lots of extras to save $ while in Maui. I baked cookies one afternoon. The grill area is great! We watched the staff meticulously clean the common areas every am. Impressive how well they care of this place. Someone else said one flight of stairs and your on the beach, true! Great walking to many amenities! Our teens snorkeled and saw turtles right from the beach. Dolphins and whales too. Cliff jumping was happening, 2-minute walk down the beach. Great space for the $ in Maui.